Scotland international David Bates says he is experiencing a "completely different game" after joining Hamburg from Rangers. Hamburg are relegated from the Bundesliga for the first time as fans delay the end of the match against Borussia Monchengladbach by throwing flares. Hamburg must win their last game of the season and hope Wolfsburg lose if they are to avoid automatic relegation from the Bundesliga. Rangers defender David Bates agrees a four-year deal with Hamburg, the German club announces. What is the best nickname you've heard in football? 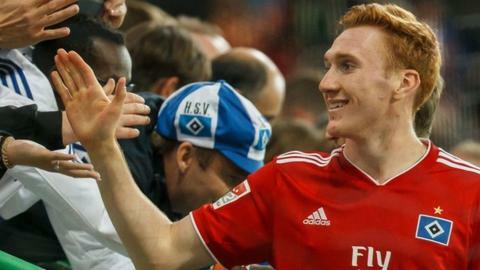 David Bates, aka the 'Ginger Ramos', talks about his first season in Germany with Hamburg SV.